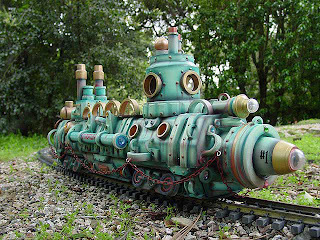 The blogosphere is abuzz over the steampunk-influenced model trains devised by artist Chris Walas, and no wonder. They just may be the coolest thing ever. Shown here is Captain Nemo's "Seafood and Saltwater Salvage Railroad" with submersible locomotive, which Walas created from "the boiler from a Bachmann ten-wheeler" and "an Aristo-craft motor block." I have no idea what that means, but I know genius when I see it. 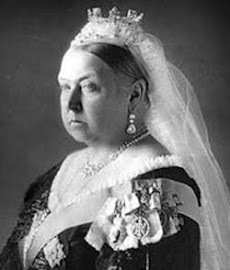 (Plastic Easter eggs, a brass anchor, a drinking straw, and a seashell were also involved.) Its salt- and barnacle-encrusted exterior was created from sand and glitter mixed with acrylic paint. From Journals of GMM: "Chris Walas makes model trains and creatures in his own alternate universe, consisting of vampires, terminators in rail wheelchairs, Victorian steampunk locomotives, Halloween skeletons, early sci-fi lunar rockets... I give up, if it is cool, Chris has modelled it." 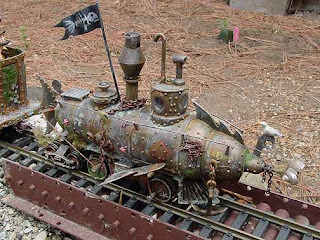 From Table of Malcontents: "When steampunk crashes in head-on collision with model train enthusiasm, you get Chris Walas' rusty, corroded, and incredible creations. Walas' creations exist in a fictional micro-realm called Rogue County, where 19th century Americana meets the super-science villains, protagonists, and inventions of Victorian literature. Captain Nemo has converted his submarine into a locomotive in this universe, and someone appears to have captured Oz's Tock and put him on rails." From Brass Goggles: "What that man does with blue foam, mustard seeds, and a hefty lick of paint puts a whole new perspective on what can be done with some ingenuity and inspiration! Please also take a look at the collaborative effort that he was part of to create Futuropolis - complete with ‘Verne Engine’ and a flying copper airship. 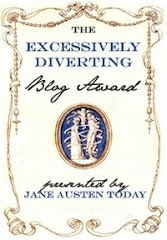 More steampunk than a brass bucket of goggles." Shown here: The "Jules Verne" engine. I like the cut of your steam-jib! Some logical nonsense, this! Did a little design work myself on a short lived series on Sci Fi called THE SECRET ADVENTURES OF JULES VERNE. Got in a few wild ones before we ran the piggy bank dry. This has to be one of the neatest sites on the web. The pictures---real good and the stories too. I will pass around---also! A new book is out by Kenneth and Mary Lou Reed about Railroad History. They worked real hard on the book and I love it. The book is a collection of some of Kenneth’s experiences as a fireman on the Evansville, Indianapolis and Terre Haute line of the New York Central Railroad. I started firing steam engines when I was 18 years old in 1953. It is also a compilation of writings and history of the Evansville and Indianapolis Railroad.